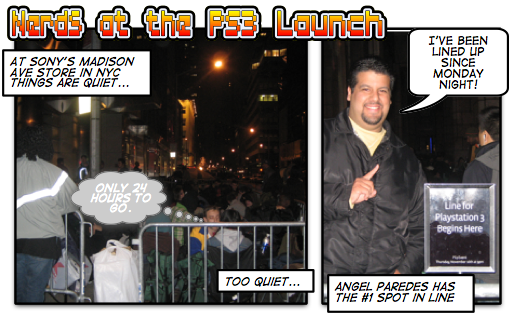 Clearly the PS3 launch is more organized in NYC than in SF: Of course that makes sense: this is where the big party is at. They've got an official line, with a signpost. And fanboys have been lining up for awhile now on Madison Ave. Since 8pm Monday night, actually, says number one spot holder Angel Paredes. As of midnight, he has 350 people behind him. Things are quiet now, but a few hours ago a scuffle broke out over line cutsies, and Sony's muscle had to step in. 24 hours to go before the PS3s go on sale.